It’s difficult for me to understand how one can evaluate the consequences of a global warming, if the local changes are so much unknown. The global consequences are just the sum of local consequences – if they are so many unknown in the local responses of winters, rains, etc.. how can one evaluate any sensible figure ? and more generally, if the LOCAL variance is higher than the long term (which can be true even if the GLOBAL one is not), how can it affect significantly the all day life of people living in some place ? The link at “Also see comments here” is broken. A space byte after “932” should be changed to “6”, and then we can get to the “Perspective” of Rasmus. It will be most interesting to see how the winter unfolds in Europe over the coming three to four weeks. I seem to remember a pattern of rather cold temperatures in late November and December, to be followed by a flip to warm temperatures in early January. Looking at the historical NAO index seems to confirm this. 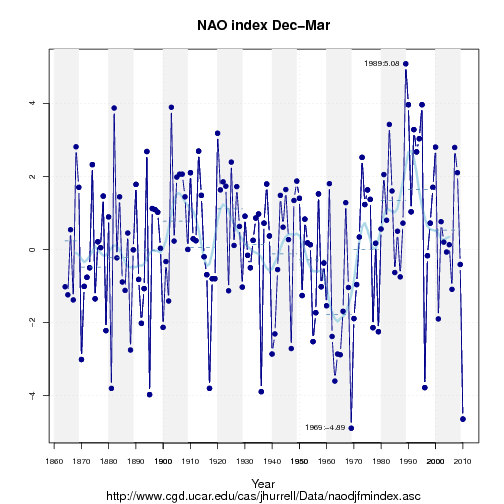 Negative NAO late in the year, then strong positive NAO after New Year has been the case in a number of years. The 09/10 winter was an exception to this, so if that is the new pattern remains to be seen. Do you reckon I can get away with thinking about it this simply? One: average global temperature is increasing. 2) It isn’t increasing evenly – most of the warming is occurring away from the equator, further towards the poles. 3) So, overall higher average temps plus some areas being warmer obviously means others will be colder. That’s obviously tautologically true of averages, but I’m wondering if it’s reasonable to think of the atmosphere as a closed system imposing that average? It would have been more clever if you’d edited the rest of the quote to match the first part, like mentioning all the different gravitational pulls Earth experiences instead of rain and snow. Suppose you have a lottery machine with the numbers 1-100 in. Every day you pull out a number then put it back. It’s impossible to predict what number will come out on any day. However, if you take an average over 10 years, then you know the mean will be close to 50.5, and each number will have been pulled out around 36 times. Suppose now every Sunday we pull out a number and add a hundred to it using a marker pen. Then after a year or so we won’t even know what numbers are in the machine. But we can still run simulations and work out an estimate for the mean over a long period, or the probability of seeing any number. Now if we run a set of lottery machines in 10 different locations worldwide, and once a decade we collect all the balls in a pool and then refill the machines at random, then we won’t even know the mean of the numbers in any one machine. But we still know what the mean of the numbers across all the machines is. It’s a bit like that. The balls are conserved through the shuffling, even though they end up in different places. The same principle is climatology is the conservation of energy – there is the same (slowly increasing) amount of heat stored in the earth’s environment, but it may get shuffled around. Gilles, do you own stocks? Mutual funds? Bonds? Ever look at the daily fluctuations? How can you invest in such instruments long term if you don’t understand the daily fluctuations? Answer: focus on long-term trends and the underlying fundamentals. You do the same for global climate. Focus on trends that persist over long times and over large distances–and of course, then there’s the physics, which is pretty unequivocal. Aren’t the deniers going to jump on this? It’s global warming even when it’s cooling? I know you are not talking about global with this cooling but how can you first tell them that you need years/decades of data to determine any trend, and so odd cold years are just ‘weather’ but then tell them after only a couple of cold winters that ‘that Global Warming could cool down winter temperatures over Europe’? I can understand them voicing skepticism when told this in the same year that the Russian heat wave WAS likely global warming not weather. That is ambiguous. Are there models that forecast that any place will be colder as a result of climate change? According to the illustration in the IPCC fourth report some places will warm less that others. Roughly speaking the illustration suggests that some hot places will warm less than some cold places reducing the differences between them. Naively I had thought that a reduction in temperature differences might lead to less extreme weather overall. William Connolly’s Stoat Blog has a recent post making fun of a Green Party member’s suggestion that the climate models forecast colder temperatures in Peru. The word “colder” is ambiguous there. 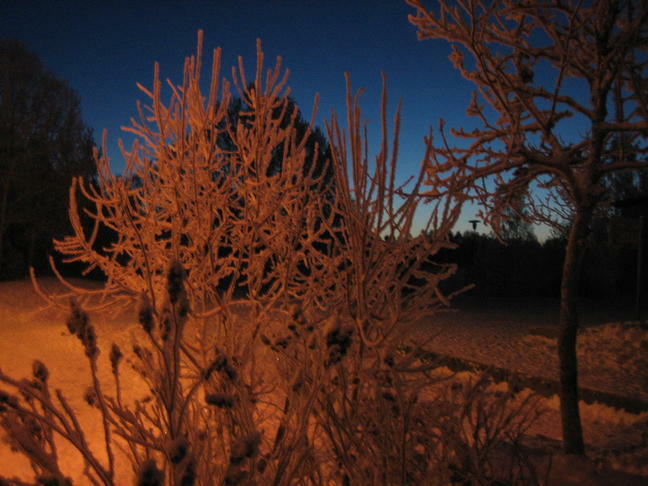 Does any climate model predict that any region will be colder as a result of climate change? The IPCC fourth report shows some regions warming less than others, but nowhere is expected to become cooler. William Connolly’s Stoat Blog has a recent post making fun of a Green Party member’s claim that the models forecast that climate change will lead to a colder Peru. Any comments, particularly about what “half a Rossby wavelength downstream” means? The straightforward response would be “for some, it can/will affect them a whole lot WORSE than the global mean.” But given the existence of breaking points in complex systems, “harm” is nonlinear, too. I don’t get it with my limited understanding. Petoukhov and Semenov used a standard climate model to figure out that European winters may get colder when sea ice is reduced in the Barents/Kara areas, correct? If so – why did they have to simulate that separately? Wouldn’t the standard model runs have to show the exact same patterns? And if they did not – why? Would it not also seem somewhat important in the larger scale of things? Shouldn’t regularly covering Europe in ice and snow for a couple of months have some secondary effects in terms of reflectivity or for the biosphere or whatever? And wouldn’t those effects add up to more than the local drops in temperature that probably average out anyway? A headline “Cold winter in a world of warming?” is popular but is based on at least very premature science. RealClimate is often accusing other media that they are mostly interested in headlines that sells and not the science behind, should not bring such thin “stories”. At least it could be discussed other premature reasons as low solar activity’s influence on jet streams and hence its blocking effect; last winter’s El Nino or low ice cover in Hudson Bay area etc. All this discussion of local effects means you cant see the wood for the trees.Is the earth currently warming or cooling? The GISS averaging algorithms are so poor as to be useless .The November discepancy between GISS and CRU is so large as to finally destroy all credibility of the Hansen group. Because of the thermal inertia of the oceans and the absence of the UHI effect the Hadley CRU SST data are the best for discussion purposes. 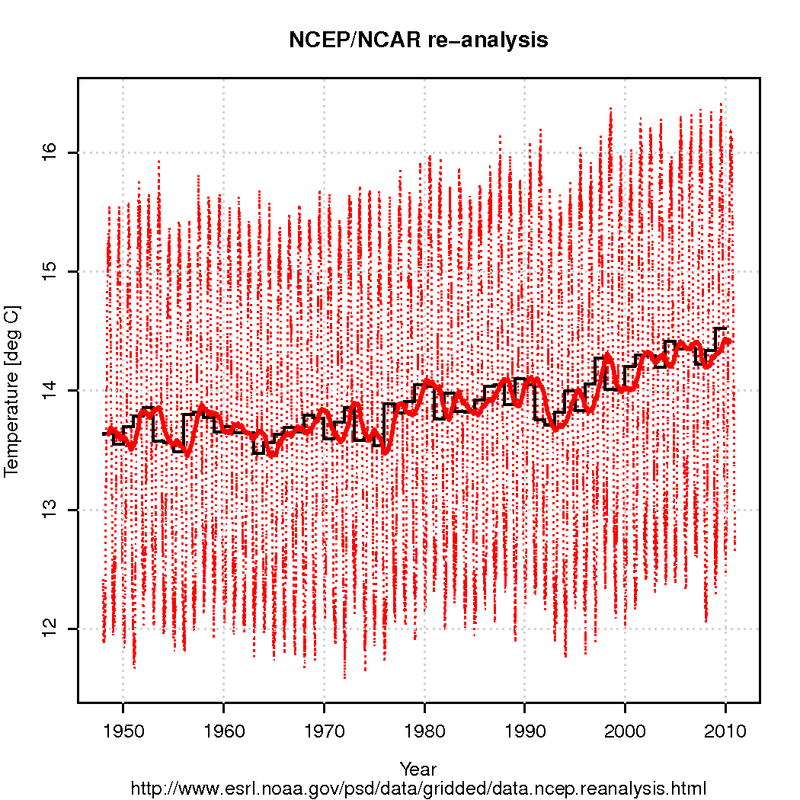 This data shows that the warming trend peaked in 2003 and a simple regression analysis gives a cooling trend since then. The geologic record shows clearly that the sun is the main climate driver. The Milankovitch multi-millennial orbital cycles in NH insolation are firmly established in the record as are the Schwab and deVries cycles. Other millennial and decadal variations in solar activity are present in the record. TSI is not the only or even the best indicator of solar activity – variations in EUV radiation and the GCR flux (via cloud formation and earth’s albedo) seem to be more important on decadal and centennial scales . Earth’s climate is the result of complex resonances between all these solar cycles with the lunar declination cycles and endogenous earth processes.Until we better understand the natural variations we cannot even estimate the small contribution 0f anthropogenic C)2 with any useful accuracy. At this time the sun has entered a quiet phase with a dramatic drop in solar magnetic field strength since 2004. This suggests the likelihood of a cooling phase on earth with Solar Cycles 21, 22 ,23 equivalent to Solar Cycles 2,3,4, and the delayed Cycle 24 comparable with Cycle 5 so that a Dalton type minimum is probable. Policymakers may wish to note the following possible effects on earth’s climate for the next 20 – 30 years. A cooler world with lower SSTs usually means a dryer world. Thus droughts will be more likely in for example east Africa with possible monsoon failures in India. In California the PDO will mean less rainfall with more forest fires in the south. However in the Cascades and Northern Sierras snowpack could increase since more of the rain could occur as snow. Northern Hemisphere growing seasons will be shorter with occasional early and late frosts and drought in the US corn belt and in Asia repeats of the harsh Mongolian and Chinese winters of 2009 – 10 . In Europe cold snowy winters and cool cloudy summers will be more frequent. The southern continents will be generally cooler with more frequent droughts and frost and snowin winter. Arctic and Antarctic sea ice may react differentially to an average global cooling. We might expect sea ice to increase in the Antarctic but in the NH the Arctic Oscillation while bringing cooler temperatures further south may also occasionaly bring warmer air into the Arctic with possible relative loss of sea ice in that areaduring those years. For the next 20 years climate science should be devoted to improving and enlarging the entire climate data base in particular with regard to solar data of all kinds. No climate model runs should be made until 2020 by which time the inputs and framework will hopefully be more relevant to the real world. #14 (Kjartan): The “warm arctic, cold continents” theory is not brand new. See for example Seiersted Bader (2008). #15 (Norman): I thought “skeptics” regarded the UAH dataset to be the only reliable one, but it might not be so popular now that it might be the only dataset that puts 2010 in the #1 spot? Also interesting that the CRU dataset is now heralded as the best. Wasn’t this dataset “proven false” in that stolen email story about a year ago. Intriguing indeed. Could its current revival and popularity have something to do with the fact that it currently shows the lowest anomalies (due to it basically ignoring the current extreme warming of large regions of the Arctic, thus the deviation from GISS)? Norman, at 15: The geologic record does not show that the sun is the major climate driver. In fact, most geologists think that the temperature changes are caused by long term changes in the carbon cycle affecting the greenhouse gases in the atmosphere. In the really long term, astrophysicists have proposed that the solar insolation should cause a warming trend. In the last 50 million years there has been a general cooling trend. It is a puzzle to me why certain people think that geologic evidence of warmer past earths in some way invalidates global warming. If anything, the evidence would suggest that the earth can change temperature within certain bounds relatively easily, i.e., that there is a high climate sensitivity. I’ve been re-reading papers on the Arctic/NH Circulation issue for the last few weeks and am still trying to get my head around it. Very complex issue. Using the Arctic Oscillation Index (AO), the monthly average was -4.27 for February 2010, that’s the lowest since 1950 (the start of the series). The next lowest was Jan 1977 at -3.77. I’ll be using February 2010’s AO as an indicator. Given that various experts are saying there was a causal link for Arctic ice in cold winter of 2010, it seems reasonable that we might expect to see similar unusual deviations of the AO in future winters. I’m still trying to reconcile my understanding of the AO and the Arctic Dipole (AD). It seems to me that the AO is still a substantial factor, despite some blogs heralding the AD as a ‘new’ dominant mode in the Arctic. I’m also pondering Stu Ostro’s work and how that fits into these changes in atmospheric circulation, both within and without the Arctic. As to why winter has hit the UK so early, that may be because of the La Nina – according to a BBC meteorologist. It’s severity may still be due to the changes in the Arctic. I await the coming winters with interest. No I don’t think such simple reasoning is correct. 1) Open water allows heat and moisture (which releases heat) from the sea to enter the atmosphere. 2) When Arctic ice re-freezes over open water in the autumn it releases the heat it took to melt. Both 1 and 2 affect the vertical temperature gradient of the atmosphere, remember, it gets colder as you go up from the surface into the atmosphere. 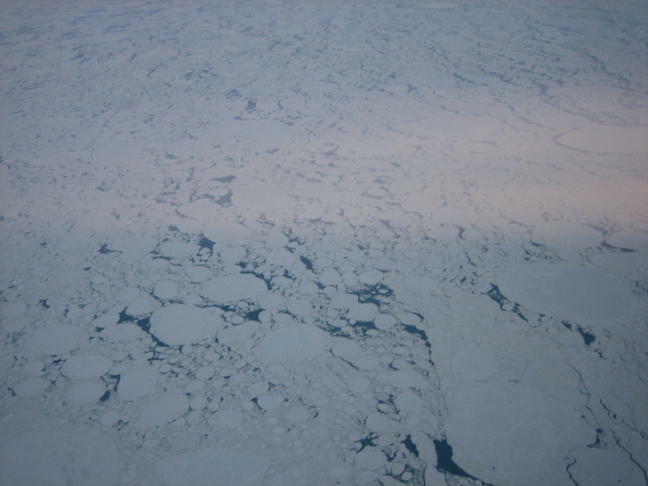 As ice cover changes factors 1 and 2 change the atmosphere in the area where the ice changes. So as there’s less ice in the Barents and Kara Seas the atmosphere above them changes. These atmospheric changes can have impacts outisde the Arctic causing changes throught the Northern Hemisphere. 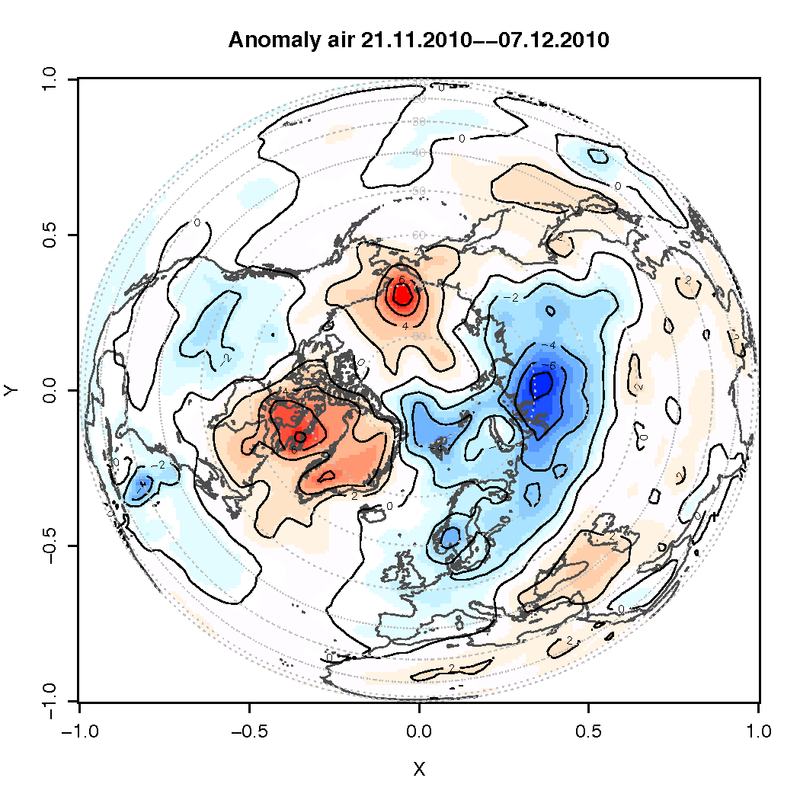 In the case of Petoukhov and Semenov’s paper they show a possible link between what goes on in the atmosphere above the Barents and Kara sea and whether we get blocking high pressure systems in Europe. When we get blocking highs they block the low pressure systems that normally bring mild air from the Atlantic, hence we cool. The November discepancy between GISS and CRU is so large as to finally destroy all credibility of the Hansen group. This comment destroys all your credibility. You should read this. Then this. One valid explanation for recent cooling trends in eastern boundary upwelling regions such as in California, Peru, Namibia and Mauritania was proposed by Andy Bakun. It is based on the prediction that continental temperature should rise more rapidly that ocean surface temperatures, so that the air pressure difference between continents and ocean would tend to decrease and intensify the equator-ward winds along the meridional coastlines. The wind forcing would then drive a more vigorous upwelling (… and hence favour sea surface temperature to drop, I just quoted the remark from one reviewer in a recent paper published in Ocean Science). My understanding of such “local cooling” possibility is indeed counter-intuitive but can explain to some extent some local cooling responses to a regional warming. Not only such a trend is apparently seen in data, but it is also already recorded in geological data (marine sediments) from all those places. The question on whether such anomalies will persist over the next decades remains of course unanswered, but the fact that GCMs cannot capture those local oceanic freatures may be due to the fact that such small-scale processes in coastal environments are not adequately resolved in GCMs. Bakun, A.: Global climate change and intensification of coastal ocean upwelling, Science, 247, 198–201, 1990. Leduc G., Herbert C., Blanz T., Martinez P., Schneider R. Contrasting evolution of Sea Surface Temperature in the Benguela upwelling system under natural and anthropogenic climate forcings. Geophys. Res. Lett. 37, L20705, doi:10.1029/2010GL044353, 2010. McGregor, H. V., M. Dima, H. W. Fischer, and S. Mulitza (2007), Rapid 20th‐century increase in coastal upwelling off northwest Africa, Science, 315, 637–639, doi:10.1126/science.1134839. Bouloubassi, I., et al. (2009), Cooling trend and enhancement of productivity in the upwelling off Peru since the late 19th century, Eos Trans. AGU, 90(52), Fall Meet. Suppl., Abstract PP41B‐1520. It is very common to hear that a single event can’t be tied causally with a long term trend. And, the example of hurricanes is given here. But there are a number of events that we may call single such as heat waves, long term droughts and seasonal weather patterns which may be causally tied in some aspects of their manifestations. If droughts are worsened and extended by average warming, then there is a causal link. If heat waves are hotter than ever before seen because the background warming makes this happen, then there is a causal link. Here, the link seems also to be with a warming phenomenon, the change is sea ice extent. This suggests a causal chain at least and it may be a mistake to compare the change of a whole season to the occurrence of any one hurricane. It’s always entertaining when someone dismisses the cumulative result of (essentially) thousands of peer-reviewed studies, then goes on for several lengthy (and not too coherent) paragraphs of “clairvoyant” hand-waving. That’s a plot of the Jetstream during the last UK cold snap, 20 Nov 2010. The Jetstream flows from West to East, Rossby waves are the meanders in the Jetstream as it flows from W to E. In the case of that graphic notice how the Jetstream is diverted South toawrds the mediterranean instead of over the UK as is more typical for this time of year. It was diverted by a blocking high pressure system extending over the UK. Hansen is saying that changes in Hudson Bay will cause changes in the Jetstream track/kinks that will propagate over the Atlantic to Europe. W.r.t the half wavelength – I think he’s suggesting similar Atlantic Jetstream track to the one in the graphic, with the kink off the US Eastern Seaboard being south of Hudson Bay, and a consequent southern track entering Europe. From someone who doesn’t understand the law of large numbers? The variance of a random variable or distribution is the expectation, or mean, of the squared deviation of that variable from its expected value or mean. Thus the variance is a measure of the amount of variation within the values of that variable, taking account of all possible values and their probabilities or weightings (not just the extremes which give the range). No, not believable at all. Then hopping on the post so quickly — and showing such unfamiliarity? Well, practice makes perfect. I suppose. Not over the Arctic ocean where there’s a strong inversion a large part of the time. Here’s my simple-minded take on this. I hope knowledgeable parties will find a middle ground to explain in plain English as much as possible, clarifying and correcting errors I am likely to make. It is logical to assume that as the Arctic melts, it will be sending cold south from time to time. Some of this water vapor, some wind. Then there’s that weird horseshoe pattern, and a kind of layer cake of warmer and colder, with the warmest in the center/top, colder to the south, etc. It appears that the pattern of ocean and land affect this. Northern Europe is situated to receive some of the worst of it, as is north-central US and Canada. Then there’s the lack of contrast between Arctic and south, which affects the boundary between hot and cold. 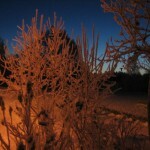 “The winter of 2009 – 2010 had the most extreme negative NAO since record keeping began in 1865. This “Hot Arctic-Cold Continents pattern”, resulting in a reversal of Polar Vortex and high pressure replacing low pressure over the Arctic, had occurred previously in only four winters during the past 160 years—1969, 1963, 1936, and 1881. Dr. Overland … suspected that Arctic sea ice loss was a likely culprit for the event, since Francis et al. 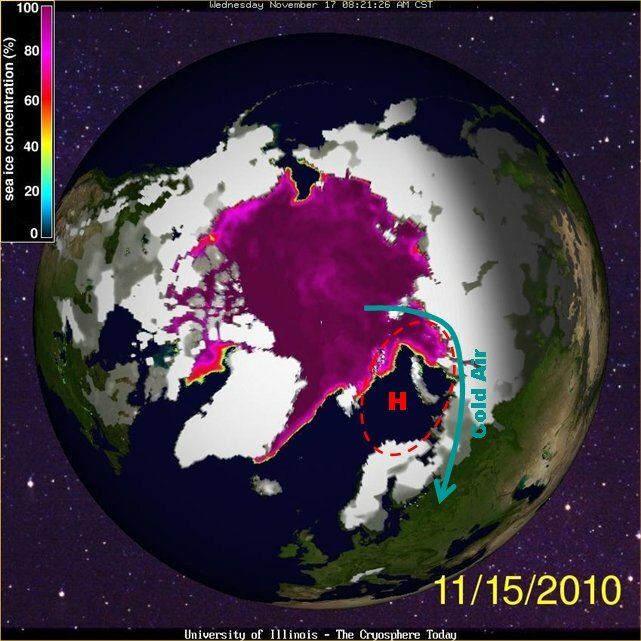 (2009) found that during 1979 – 2006, years that had unusually low summertime Arctic sea ice had a 10 – 20% reduction in the temperature difference between the Equator and North Pole. This resulted in a weaker jet stream with slower winds that lasted a full six months, through fall and winter. The weaker jet caused a weaker Aleutian Low and Icelandic Low during the winter, resulting in a more negative North Atlantic Oscillation, allowing cold air to spill out of the Arctic and into Europe and the Eastern U.S. …. Not every year that we see extremely high levels of Arctic sea ice loss will have a strongly negative NAO winter…. “What advice would you give to scientists about reaching out to the public? oops, those last paragraphs are all from John Cook at Skeptical Science, for the quotation marks. Re Arctic Surface Based Inversion: I was trying to keep things simple and the impact I outlined was mainly in the autumn season (when such inversions are less common). What is CRU’s November number? I use this analogy when explaining why a few degrees C will make a difference in our everyday lives when weekly temperature changes can be so large. The average annual temperature of Chicago is about 5 C lower than Memphis. Have you been to Memphis anytime between May and September? It’s hot and humid and hot and humid beyond belief. Yet that’s going to be Chicago’s climate by 2080 if we persist on our current carbon path (GISS climate models). It may well be a lot drier to boot. There has been some discussion on meteorological websites that this European cold weather is caused/affected by stratospheric warming episodes affecting the polar vortex. Would this be consistent with this, and what mechanisms might influence the stratospheric weather? Norman Page, Thank you so much for your post. Thanks to you, I was able to fill in completely my Denialist Bingo card–all from one post. Unfortunately, while your “throw everyting including the kitchen sink against the wall and see if it sticks” approach ain’t science. Let me know when the denialists develop a climate model that comes close to explaining anything about this planet’s climate. Then we’ll talk. Oh, and give Anthony our love. Fascinating collection of publications and presentations at your web page. Well I hope you are not a geologist because if you are, you should know better. The sun is the dominant source of energy to Earth’s surface and hence regular variations in orbital parameters are important drivers of cyclic climate change. However, beyond the relatively brief “snowball Earth” episodes between 500 and 1000 million years ago, the geologic record shows that surficial conditions on early Earth were not uniformaly cooler than at present in spite of incoming solar energy being up to 30% less. This is known as the “weak sun paradox” and must involve some aspect of atmospheric composition to be explained. Regarding comment #9 by Lazarus, it seems a solution would be to make the title more specific to something like “Cold local winters in a warming world” or “Cold regional…” or “Cold European and eastern U.S. winters…” (needs a bit of work). We could just as accurately write “Unusually warm Arctic winters in a warming world”, as such unusual cold in Europe and eastern U.S. is often coupled with very mild temperatures in parts of the Arctic. Deniers will still spin it but it’s a little more difficult when some ambiguity is removed and it’s made clear what this particular analysis is referring to. I guess there would be a discrepancy, since CRU data for November doesn’t appear to be out yet. NCDC is, and is pretty close to GISS. …but if CRU was out, and if you found the baseline-adjusted value difference with GISS to be “large” (well beyond monthly statistical error bars), why in the world would you jump to such a conclusion? Wouldn’t you want to scrutinize HadCRU (a dataset that inherently assumes the Arctic is warming at the same rate as the rest of the world) equally, or is it just the fact that you want to believe warmer values are inherently not “credible”. An analogy that people might understand is the effect of wind speed on ocean waves: as the energy in the wind increases, the magnitude of the waves increases, and the peaks get higher AND the troughs get lower. Change wind speed to insolation (actually, in this case, heat retention through CO2 accumulation), and allow for greater spatial and temporal complexity, and higher average energy produces higher highs and lower lows. The effect of the wind on the waves is well known, yet too complex to be modeled exactly; so the inability to make exact predictions in most cases does not contradict the basic result. In like fashion, the GCMs can not accurately predict where and when the relative increased highs and relative decreased lows will occur, but that by itself does not contradict the notion of gradually increasing total heat (and higher averages) in the system. Chapters 18 and 19 of “Modern Thermodynamics” by Kondepudi and Prigogine provide an introduction to nonlinear dissipative systems for thermodynamic science. The experimental and computational examples are much simpler than the climate system, being small 1 and 2 dimensional systems with constant input: whereas the climate system is huge with millions of dimensions and spatially and temporally varying input. But the many traveling waves (Rayleigh waves) and other oscillatory systems are the sorts of things that the theories qualitatively predict. From the main text: Rather, recent analysis suggest that the global mean temperature is marching towards higher values (see figure below), and Petoukhov and Semenov argue that the cold winter should be an expected consequence of a global warming. That unfortunately may not be true, either in the near future or ever. The system is exceedingly complex and chaotic. With parameters (sometimes called physical constants) estimated to only 2 or 3 significant figures, even the best predictions may never accurately predict exactly where and when the temperatures will be above and below average for the time and place; only that the global average will increase (mostly monotonically). AGW may lead to post-hoc partial understandings of how some extremes have been produced (e.g. last NH winter and the present NH winter) without being precise and complete enough to predict them in advance. That is an unfortunate situation that makes AGW look like astrology; but it seems to be the nature of the science. As long as the global mean temperature (or global total heat content) rises, the reappearance of record cold waves does not disprove AGW. Consequently, to paraphrase a quote from another thread, statistical analyses are essential to deciding whether AGW is true (and how much warming to expect), and studies of mechanisms can’t be expected to yield reasonably accurate predictions any time soon. defecation). Absolutely priceless, and well suited to my current, frivolous holiday mood. The Chicken paper, as well, is also an example of science presented in a way that makes it accessible to the common man. If only papers in the field of climate could be so clear and inarguable. Why does avian science seem to attract the most talented intellects? Winters were warming. Then the Arctic ice crashed in 2007 and as a result of the subsequent changes Winters got colder. If you left your windows open on a winter’s night and felt cold, you’d assume your central heating was worthless and proceed to rip it out and trash it? Rossby waves: I just read about them in John Houghton’s “The Physics of Atmospheres.” Other planets have Rossby waves as well. They are caused by the spinning of the planet with a fluid atmosphere. There are several modes available and these modes produce different wave numbers. With one wave number, the nodes can move around the planet. Have I remembered it correctly so far? “Cold” winters: NOT any more. Anybody who thinks recent winters are cold has a short memory or has moved too often. Recent winters, including this one, are WARM. Clothing manufacturers are skimping on the insulation in “winter” coats, making you feel cold. Youngsters [20 something] call me crazy for remembering being outdoors when the straight temperature [not counting wind] was 40 below. And it doesn’t snow much any more either. It snows when it is warm, not when it is cold. 28 degrees F is warm. When the temperature gets to 40 below, the snow stops coming down in lake effect areas. That is because it doesn’t get to 40 below until the lakes are frozen over, depriving the air of its water source. I haven’t gone through all the comments in detail. But it seems to me that expecting warming to produce a colder winter shouldn’t be that intuitively difficult. Wisconsin has much hotter summers than New York City, yet winter there is positively brutal. Without a large body of water nearby, you expect extremes. In the case of a warmer body of water, it strikes me as not at all counterintuitive to think that there might be some effect that would make things colder locally — the old example of what would happen to Europe if the Gulf Stream switched off is one way you could have an ocean on average warmer and still have South Dakota-like winter weather in England. I guess the really interesting point is that the climate system already has the potential to go into an ice age next tuesday- all it takes is an impossible redistribuition of heat in the climate system this weekend. It is so funny, the world is cooling down, it is getting colder and colder and you morons still continue to preach complete B.S. Watch the next 10, 20 or more years progressively get colder and colder each and every year. I bet none of you warmers will wise up! Hope you all freeze! From an IPV distribution and some boundary conditions, and the coriolis parameter f (equal to (vertical component of) planetary vorticity), and a relationship between mass and wind (such as geostrophic or gradient-wind balance), a flow pattern can be reconstructed. Allowing geostrophic adjustement to the IPV distribution, IPV anomalies induce cyclonic or anticyclonic circulations within and around themselves depending on sign of anomaly and hemisphere. Thus, if there is a (quasi-horizontal) IPV gradient, such as increasing from south to north, then if IPV is conserved, or at least doesn’t change too much, an IPV wave induces circulations that, by IPV transport, produces an IPV wave that is out of phase with the first wave; specifically, the wave propagates with a component of phase propagation perpendicular to the IPV gradient and parallel with IPV contours – this is westward for IPV increasing northward. The group velocity (the velocity with which wave energy, momentum (? ), amplitude variations, etc, propagate) is an interesting function of wave vector (wave vector is in the direction of phase propagation perpendicular to phase lines or planes, and has a magnitude inversely proportional to wavelength), such that, spanning the spectrum of Rossby waves, the group velocity can be in any direction. As just described, the group velocity and phase motion are relative to the flow itself; thus if superimposed on a westerly flow of sufficient speed, a wave of some orientation and wavelength may be stationary relative to the Earth. Quasistationary waves can be produced or sustained by stationary features that disturb the flow, such as topography or SST anomaly; group velocity carries wave activity around the globe while the phase distribution approaches some stationary equilibrium; the amplitude will depend on the wind speed and the wavelengths of the features that are forcing the waves. Wind hitting topography can impart westerly momentum from the air to the Earth below (the momentum cycle also includes viscous dissipation of wind and is closed by a transfer of westerly momentum from the Earth to the atmosphere at lower latitudes); Quasistationary waves in westerly flow that are forced by topography that tilt westward with height have an upward component of group velocity; wave energy may be dissipated at higher levels, which causes a westward acceleration there. Rossby waves at different locations with oppositely-directed IPV gradients can amplify or weaken each other or niether, depending on how their phases are lined up, and also ‘propagate’ each other towards a different phase alignment, toward that which favors mutual amplification; for particular combinations of conditions, distances, and wavelengths, the two sets of waves can phase-lock and grow exponentially (until nonlinear effects become important) – this is baroclinic and/or barotropic instability (baroclinic for Rossby waves at different vertical levels at the same horizontal location, barotropic for waves at the same level (or same isentropic or isopyncal surface, I would think) interacting across a horizontal distance); for other combinations, the self-propagation of the waves or the different flows themselves will overcome the interaction and keep shifting the waves’ phase alignments. A location where the flow moves with the phase propagation of a Rossby wave is called a critical level. Potential temperature (defines isentropic surfaces) or potential density (defines isopycnal surfaces) may vary along an upper or lower boundary of a fluid; geostrophic adjustment to anomalies at such a boundary produces a structure as if an IPV anomaly existed, so that gradients and anomalies in potential temperature or density at a lower or upper boundary act like IPV gradients and boundaries, with higher potential temperature or lower potential density anomaly at a lower boundary (such as, for the atmosphere, the Earth’s surface) acting like a cyclonic IPV anomaly; it’s opposite for an upper boundary. Thus, Rossby waves (if I’m not using the term too generally) can occur at the surface due to topography in a stratified atmosphere or due to a horizontal temperature gradient, or some combination; the horizontal temperature gradient is important for the baroclinic instability that gives rise to extratropical storm track activity. Rossby waves can also occur at an IPV front between regions without IPV gradients – the combination of the two implies the possibility for Rossby waves to propagate along a line. The dispersion relationships are different for such upper or lower boundary and also for PV-front waves. A PV front would induce a jet. I’ve read that all Rossby waves on a PV-front would have critical levels on either side, where the wave is not propagating through the fluid, so that continual displacement results in mixing, so that PV tends to become more homogeneous on either side. Jets on PV-fronts are also ‘flaccid’ as well as ‘elastic’ (there’s an article – don’t have the website offhand). Rossby waves can be reflected and refracted, emitted (forced), and absorbed, they can break via nonlinear effects (also ends in absorption so far as I know); they can be advected – and they can be distorted by the flow. They can be ‘overreflected’ (I don’t know a lot about that yet – I had imagined it’s a bit like ‘stimulated emission’ – or maybe not). They can even tunnel across barriers to propagation (see also ‘evanescent wave’) When Rossby wave activity leaves an area, the wavelength-averaged flow will tend to accelerate (westerly acceleration in the case of cyclonic IPV increasing poleward, which is typical); Rossby wave activity arriving at an area tends to cause the opposite acceleration; absorption of Rossby wave activity makes this change ‘permanent’ (until something else happens, of course). Wave energy and momentum (? ), propagating with the group velocity, are transported from where activity is forced/produced to where it is consumed/absorbed. Nonlinear interactions allow Rossby wave activity to spread from different parts of the spectrum to other parts (to different wave vectors); see also ‘Rhine’s scale’. Rossby waves and (I)PV are key to much understanding of the atmospheric (and oceanic) circulation. But the topic is ‘cold winter in a world of warming’. not evenly distributed longitudewise, one should expect some effect on the mean (circulation pattern thoughout the northern hemisphere.